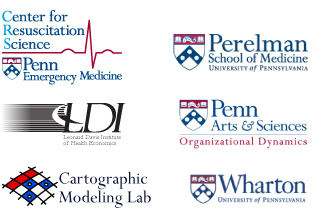 As health professionals dedicated to saving lives and expanding the horizons of theory and practice—this interdisciplinary team has come together to engage and challenge the Philadelphia community to improve access to critical life-saving technologies. By harnessing the increasing reach of new media we hope to bring innovation to address an important public health disparity. The UPenn MyHeartMap Team is initiating the MyHeartMap Challenge project to locate installed AEDs in Philadelphia County. Philadelphia County, with an estimated 1.5 million inhabitants and an estimated 500,000 daily workers and visitors, is the country’s 5th largest city and home to Center City, the 3rd largest downtown residential population in the United States. Philadelphia represents an ideal location for the inaugural, MyHeartChallenge pilot program. This pilot program is part of a larger ongoing collaboration between faculty of the University of Pennsylvania and the University of Washington to improve resuscitation care throughout.